"...the questions are excellent and have taught me and my students a great deal. 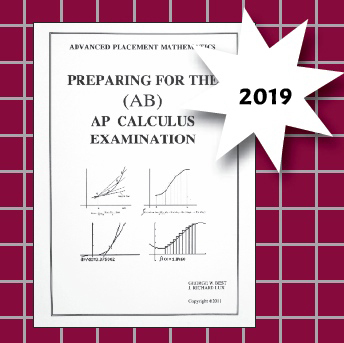 It is the best book of practice AP questions available..."
"...All of my kids raved about how well the Best/Lux problems prepared them for the AP Exam. In the previous 4 years, I have had 61 out of 65 students pass the exam with 45 of them getting 4 or 5s. I credit much of this to the Best/Lux problems." This edition of the book consists of six sample AB examinations. The questions in each test have been updated to reflect recent changes prescribed by the College Board. The new topics have been included; multiple-choice questions have four answer choices. Each test contains 45 multiple-choice questions, divided into two separate non-calculator (30 questions ) and calculator sections (15 questions). The 6 free-response questions are divided into two separate calculator ( 2 questions) and non-calculator sections (4 questions). The book also includes answers (not solutions) to all questions and all questions are indexed by topic so that teachers or students can find questions on specific topics for further review. The six tests provide valuable practice in judging when and when not to use a graphing calculator. The questions are challenging and similar to those your students will experience on the AP calculus examinations. The authors have many years of experience teaching calculus and grading AP exams. A great resource when you are trying to give your students an effective review prior to the AP examination. These books are specifically written for student use and the minimum order is for 10 to 25 books at $20.00 each. There is a quantity price reduction for purchase of more than 25 books. A student solution manual is also available. Sample questions may be requested for preview. 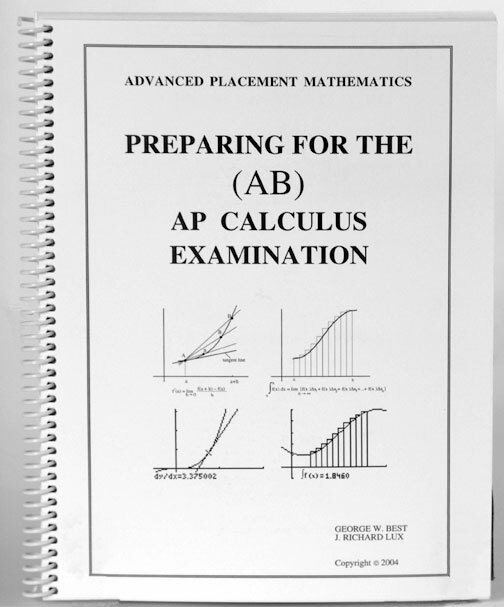 This book contains the complete solutions for the problems in Preparing for the (AB) AP Calculus Examination. It is instructive to see correct solutions for each of the multiple-choice problems; however, the real benefit to students and teachers may be the elegant and thorough solutions to the free-response questions. Too often students during the AP exams are unsure about how much to write for each free-response problem. The solutions in this book contain all that is needed to get a high score on each problem. If a problem can be solved with or without a calculator, both solutions are included. The minimum order is for 10 to 25 books at $15.00 each. There is a quantity price reduction for purchase of more than 25 books.